Even if you are not overly familiar with the ideologies of permaculture, you may have heard the term integrated pest management (IPM) being thrown around lately, especially if you are an avid vegetable gardener or just tend to hang around people that like to talk about nerdy-plant stuff like this. If you are not familiar with either terms, allow me to introduce you to a wonderful concept that blends the complexity and resilience of natural ecosystems with the means of how we traditionally have viewed agricultural pests and how to deal with them appropriately. ‘Appropriately’ apparently seems to refer to the vast majority of pest management techniques that have been in place for last few decades which includes the application of petroleum derived herbicides, fungicides and insecticides. We, as a collective society supported by agriculturalists, are slowly beginning to realize that these techniques cannot be sustained over the long term as we previously thought from the beginning. As well, the ‘pests’ that we are trying to eradicate using this man-made compounds and environmental poisons are becoming less and less effective on the very organisms that they were designed to kill. Is there something else that can be down to replace this outdated and destructive practice? The good news is yes, and it gets even better than that. Not only are there a wealth of options that can be implemented by larg(er) scale farmers and backyard gardeners alike, but many of the potential solutions use traditional knowledge that we have known all along and it’s just a matter of bringing that skill and region-specific expertise back from the proverbial grave and bring it back to the spotlight once again. Seems like we shouldn’t be so careless as we have been to discard seemingly ‘outdated’ information, because it might save our butts one day, such as today. Anyhow, I was lucky enough to come across a particularly interesting relationship and a textbook example of IPM in my own backyard that could potentially be expanded to suit the demands of a large scale operation if the need for it existed, and I am pretty sure that that need does exist or most certainly will in the near future. I have 3 different varieties of organic potatoes that total 9 individual plants that are situated in a garden that I curate with a dear friend of mine. These potato plants are as healthy as can be, despite the fact that the threat of Colorado potato beetles is continuous in much of North America. 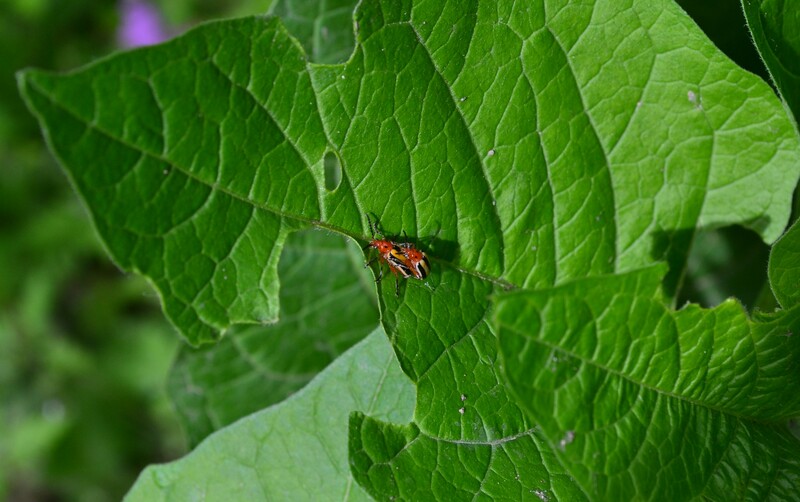 If you don’t know, these brightly colored beetles will gleefully munch away at the foliage of your potato plants surprisingly quickly, and that is definitely not something that most people would like. Your potato field/patch could turn into a Colorado potato beetle breeding test plot in as little as a week if the infestation is severe. Colorado potato beetles copulating on a Physalis leaf that has also served as their buffet. Please don’t do that, it’s just going to make more of you. One aspect of IPM that I have read about over the years involves the planting of ‘decoy’ species a reasonable distance away from the crop that you want to protect. Most often insects that prey upon certain crops will also favor other closely related plants that have similar habitat requirements, biological features and/or other aromatic/chemical properties that are appealing to the insect species. By intentionally planting a related species close to the crop that you want to preserve, a great proportion of the insects you are trying to get rid of will be attracted to your decoys and be led astray from your intended crop. This is a relationship that is widely observed in healthy, functioning natural ecosystems and this works in part due to the physically multi-layered environment of an ecosystem which is lacking in typical monocultures but mostly due to the density or diverse composition of species present. With each genus or family of plants being represented by a number of different species in an ecosystem, no one plant will be singled out by a pest, although of course this does not happen all the time, especially when diversity in ecosystems are low or they have been modified by human intervention to some extent which may have interrupted any complicated processes which may have been present prior to that disturbance. It just so happens that there is a small patch of a plant called Chinese lantern (Physalis alkekengi) growing at least 20-30 yards on a partially shaded slope away from where my potato plants are growing in the confines of the vegetable garden. Chinese lanterns a common self-seeding annual ornamental plant that has inconspicuous flowers in late spring and early summer but later in the year produces bright orange ‘lanturns’ which are actually small orange tomato-like fruits surrounded by an paper-like calyx which is also bright orange in color. These often persist on the plants even after all the leaves have dropped in autumn. These plants, although a native of Europe while potatoes originated in South America, are both in the Solanceae family, which includes the genus Physalis, as well as such familiar treats as tomatoes, potatoes and eggplants. From my observations made earlier today, it seems that Colorado potato beetles also seem to love munching the leaves of the Chinese lantern plants and consequently I have not observed any beetles attacking the potatoes in the garden. Despite the fact that I got lucky and these Chinese lantern plants were already present elsewhere close by to where the vegetable garden is situated, this is a very real-world applicable example of something that could be replicated very easily. You may have to integrate other measures to address a very large and extensive population of Colorado potato beetles, but on a small scale where a vegetable garden is surrounded by a wide variety of different ecosystems and plant species, diversity has a way of keeping populations of almost everything under some sort of control, even if it is slight or difficult to detect. As a bonus, P. alkekengi is in the same genus as P. virginiana which is known as the Virginia ground-cherry and P. peruviana (cape-gooseberry, a commercially cultivated species). These species both have delicious, edible tomato-like fruits and although P. alkekengi doesn’t get as large or tasty fruits as the other species, it is still worth eating if there is an abundance of it. So not only does this species provide a decoy for your Solanum-loving insect and fungal pests, but they may provide a small crop of their own if the damage that they sustain from the pests is not too great. I was an awe when I discovered this remarkable relationship and example of the interconnectedness of ecology at work in my own yard, and was even more impressed knowing that this is an important lesson not just for myself but for others as well. As we collectively learn new things in the race to adapt to our changing attitudes, cultures and physical environment, lessons like this that nature provides us with are certainly not something to ignore and are often delivered in an entirely nonchalant manner. It takes keen senses and a quiet contemplative mind to be able to detect the subtle hints that are being presented to us all the time, and developing this awareness is of the utmost importance now as we are beginning to remember our traditional ways of living off of the land and making the land work for us. It seems in order to do that, we have to keep certain aspects of nature (i.e. most if not all of them) also functioning alongside and in peace with the way that we choose to modify our environments to suit our wants and needs.